A time capsule buried in 1928 has been unearthed by construction workers on a demolition job in Lancashire. Found inside the walls of Lytham Hospital, it contains artefacts and documents from the late 1920s and from the original construction in 1871. 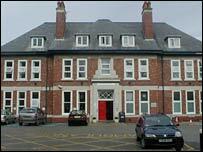 The building, on Warton Street, Lytham, is being knocked down to make way for a new health centre. It is hoped the items found in the time capsule - which include a newspaper and some old coins - will go on display. The time capsule is a sealed metal container which had to be opened by a local blacksmith. Some coins were found inside along with a note explaining they had been found under the foundation stone of the old hospital building. Two shilling, one shilling, 6d and 1d coins were found. A second document found inside was a note from the hospital chairman, John Pearson, written to mark the stone-laying on 19 October 1929. More coins rolled up in the note were a half crown, dated 1929, a florin dated 1923, a shilling dated 1926 and a sixpence dated 1928. A copy of the Lytham Times, dated Friday 18 October 1929, was also found inside.